So, I finished some projects yesterday. Since moving to Austin, we haven’t had a chance to do anything SCA-related. Well, that’s not entirely true. We have been going to the Tuesday night fighter practices, but nobody (except the fighters) dresses up or anything. Next weekend there’s a Land Court, wherein we all dress up and beg the Baron for land befitting our station and rank. 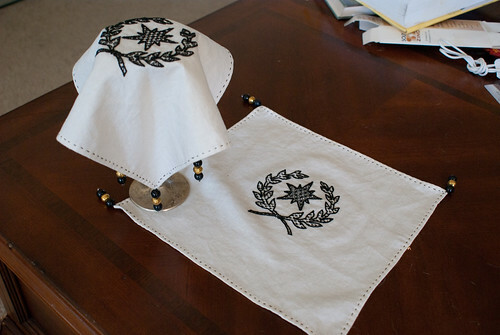 So, as a small bribe for Their Excellencies, I made some goblet covers for their largess basket. 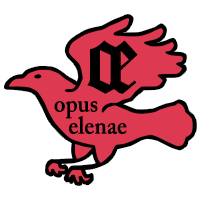 Typically nobles try to have on hand some small items with which to reward people. Problem is, they generally don’t have time to make said items themselves, and rely on others to provide them with things to give away. A while ago, my champion Richard linked me to a small essay that a woman had written about her views on largess. She views largess as part of her feudal duties. She doesn’t fight, so she gives largess instead, one piece for each of the “lands” that come with her awards. I thought that was a pretty cool idea. 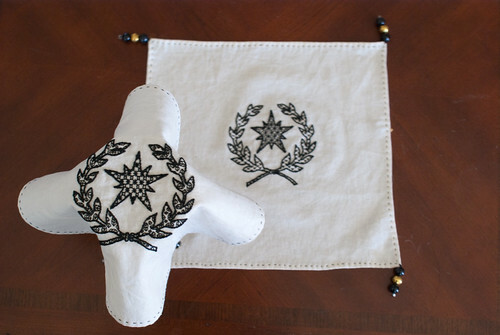 Since I just got my Award of Arms (pictures coming as soon as Richard sends me the actual scroll), I figured it’d be neat to start off giving my Excellencies some pretty things. The covers are about 12 inches square. The next time I make them, I think I’m going to cut it down to 8 or 10 inches. They’re pretty, but they come really close to being too long. The really only work with fairly long-stemmed goblets. The designs come from the Barony’s coat of arms. 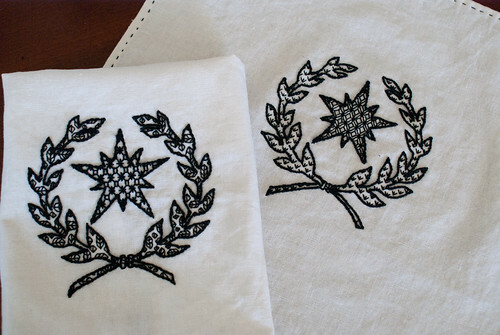 I decided to make these guys in blackwork instead of stem stitch because their Excellencies have both late German and Elizabethan personas. I figured blackwork would be quicker than German brickwork. I tried to make the motif small enough that the laurel wreath, or at least most of it, would be visible when placed on the cup. These were so much fun; I can’t wait to make more. And more, and more. Now I know why Isabetta has a bajillion of them; they’re totally addictive. 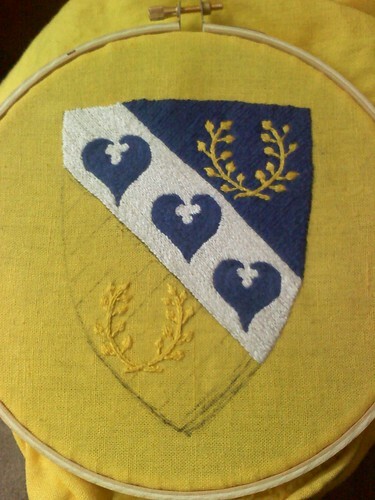 Next up: embroidering Richard’s Champion’s favor. I miss my Shire. They’re my people, the ones who first got me into the SCA, and taught me that it could be something more than drunken parties, or stick-jockeying. That there are people for whom the love of history comes first. When Nick and I decided to move to Austin (Barony of Bryn Gwlad, Ansteorra, if you’re interested) one of the things that tore me up was the fact that we were leaving this group behind. So, to always have them with me, I decided to make a favor with the Shire’s coat of arms on it. I’ve been working on it pretty steadily since I posted last, and it’s almost done. It’s actually a bit more done than that. I divided the last part up into three parts: the plain blue part above the laurel wreath, that plain blue part below it, and the really fun bit in the wreath. Yesterday I finished both plain bits and this morning I’m into the laurel wreath part. I don’t think I’ll get it done today, but certainly by the end of the week.